Even Karl Roves critics call him a genius, but a close look at his past reveals throughout his career he repeats the same basic pattern: trash opponents with dirty tricks, recruit loyal Republicans who might not be highly qualified, but could be easily manipulated -- such as George W. Bush. 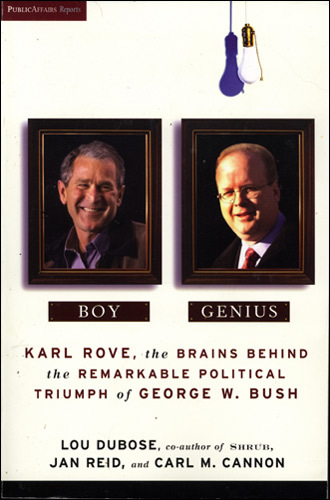 BOY GENIUS traces Roves rise through Texas politics to the 9/11 attacks, with much of it following the interlaced destinies of Bush (the boy) and Rove (the genius). Told here for the first time are stories such as the critical moment at the 1994 Texas GOP convention when the pair saw little enthusiasm for Bush as the partys rising star, and they made a strategic decision to appease the Christian right. Also revealed are insights into both men, with Karl Rove shown to be an insecure loner who once said, "I have no other persona than Bush," and the non-compassionate side of Bush is shown in his dismantling the Texas prison systems drug and alcohol rehab program because he personally didnt need a 12-step program to kick his drinking problem.